This week, Wavelength’s Peter Lee, Barbara Hamilton-Bruce and Morgane Van Ermengem captained some of the teams that participated in the first Legal Design Challenge. The event was jointly facilitated by Wavelength, DWF, LEx Open Source and Radiant Law; its objective was to explore a new standard for commercial contract lifecycles. As challenges go, the contract lifecycle is a biggy. 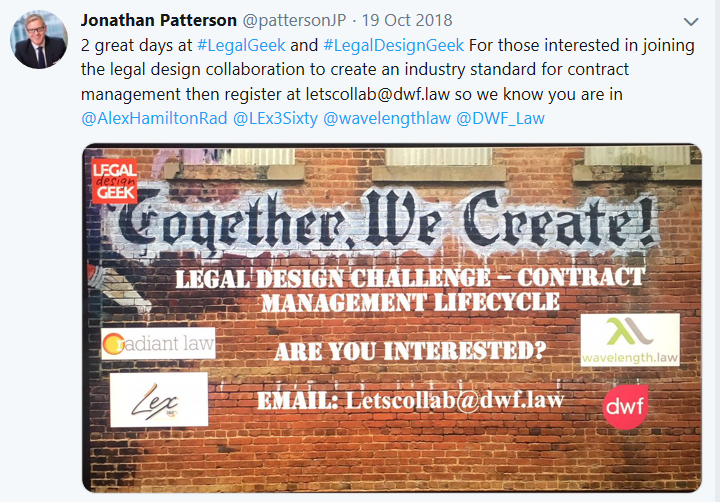 To paraphrase a speech given by DWF’s Jonathan Patterson during 2018’s Legal Geek… contract management is the lifeblood of many businesses and the bane of many lawyers’ lives – there is a degree of pain, risk and cost in contract management that requires an industry level solution. Progress to-date in this area has been siloed within individual businesses. On 25th March 2018, a gloriously sun-filled day in London, Wavelength helped facilitate a Legal Design Challenge together with DWF, Radiant Law and LexOpensource. The goal was to pick up the gauntlet that was thrown down by Mo Zain Ajaz and Jonathan Patterson at the inaugural Legal Design Geek - to use legal design thinking to collaboratively interrogate and improve the contract management lifecycle. We were fortunate enough to be joined by talented participants from a range of legal disciplines and businesses, all looking to harness their energy and commitment to industry-wide change. With such diversity of thinking, experience, perspectives and awareness of industry pain points in the room, we knew that whilst we weren’t going to solve the entire contract lifecycle ‘problem’ in one day, we were confident that we could make a good start through the smart application of legal design thinking. Rather than approaching the problem by listing ‘things’ that need to be fixed, we led by thinking about the perspective of the users – the humans in the process – to focus on an area of the contract lifecycle where we might be able to make a significant impact. It was clear from the collective experience in the room that many stakeholders are feeling frustration about the contractual process, no matter their business or role. Through this user-centric approach, we were able to narrow down on the subject matter and start to unpick the problem, sharing perspectives and understanding the drivers and motivations that might be leading industries to behave as they currently do when dealing with contracts. The participants shared ideas and insights into what good contract management could look like and, importantly, how change could be made to stick for the long-term. In line with any good design activity we got visual, using a range of tools and approaches to help gather information (including a virtual rainbow of Post-it Notes) as we worked in short sprints and challenge sessions covering the 31st floor windows of 20 Fenchurch Street, and overlaying the stunning view of London, with something that the design geeks in the room found just as aesthetically pleasing! It’s always a privilege to help facilitate events such as these, to enable collaboration beyond the normal business silos that often stifle innovation, and to see the power of human-centred problem solving. Because we’re committed to industry-wide change - before the end of April you’ll have the chance to review the know-how we gleaned from the Legal Design Challenge. The main deliverable from the event will be the open source publication of information and/or resources from the day with a view to ensuring that the conversation and action keeps moving forward. Watch this space! About the author: Barbara has joined Wavelength as Head of Client Operations. She is a Chartered Legal Executive with expertise in legal operations and transformative change.